Surely nobody can be too surprised by news that GoinGreen’s G-Wiz is not the ideal vehicle in which to be hit by a lumbering 4x4. 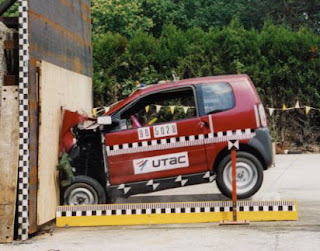 The little electric runabout, which qualifies as a “quadricycle” in law (but which we prefer to think of as a wheeled plastic pig), was hurled at a deformable barrier on April 10th by the UK’s Department for Transport. We haven't seen pictures of the tests, which were done to the standards required of conventional cars, but they no doubt resemble a soft-boiled egg being struck with a cricket bat. In an article at The Times, GoinGreen bleats that safety would make the G-Wiz too heavy to qualify for the quadricycle category, opening it up to the full rules governing proper motor cars, which would in turn push up prices and balloon running costs. This seems like an iffy defence, bearing in mind that the weight assessment is done before the heavy batteries are inserted, and also that rival electric quadricycle the Mega City, sold by the Nice Car Company but made by Aixam in France, has - allegedly - passed the very same tests. We've asked Nice for comment on the safety-equals-weight-plus-cost issue and will pass any feedback on in due course.